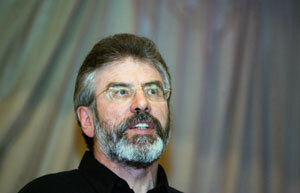 Sinn Féin President Gerry Adams has reiterated his appeal for anyone with information relating to the remains of those killed and secretly buried by the IRA almost 30 years ago to bring that information forward. Gerry Adams said: “Last August, after lobbying from Sinn Féin, the British and Irish governments announced their decision to retain the services of a forensic expert who had produced a detailed report with recommendations on how to recover the missing bodies. “I expect work will begin this spring and summer to implement the forensic experts report. “It is vitally important that those charged with this difficult task have all the information possible to make their efforts a success. While I am mindful not to raise expectations by the families I know that the IRA has met with the forensic expert and that each site has been visited by the expert and the IRA, including individuals with primary knowledge. “However, if there is any other information available which might help I am appealing for those with it to now bring it forward. This is particularly the case in respect of the disappearance of Charlie Armstrong whose family I have met a number of times. “I have previously appealed for anyone with information relating to Charlie Armstrong to come forward, either to me directly, or to the family or to anyone else who they have confidence in. I want to renew that appeal today.